Every type of plant has its day. African Violets dotted window sills in the fifties and sixties, becoming the official flowers of a generation of grandmas. In the nineties, Peace Lillies and ferns reigned supreme, their deep greens contrasting with pastel patterned wallpaper and matching ruffled drapes. Of course, handy Aloe has always hung around, ready to help out with little burns and scrapes. Then in the early 2010's, we reached a new phase. Little succulents started popping up all over the place. You could plant them in all sorts of containers, water them just a little bit, and watch as they took care of themselves. They were cute, sure. But here's the thing, they'll never be as iconic as the brand new upcoming trend, cacti! The bright greens of the cactus bring the bright wilderness of the desert into your home. You can almost hear the call of the coyote. Right? Well, maybe not. But prickly cacti are so cute, we're sure they'll be a hit at this year's costume party. Your little cactus won't have to worry about prickling anyone's skin in this cactus costume, the fabric is actually quite soft and cozy! The tunic has a pot attached to the bottom and sleeves that flare a little for the rounded cactus shape. The shoulder and matching hat are both accented with a flower for an extra touch of desert color. Have your little one represent everyone's favorite fad with this bright costume that's sure to stick in everyone's mind. 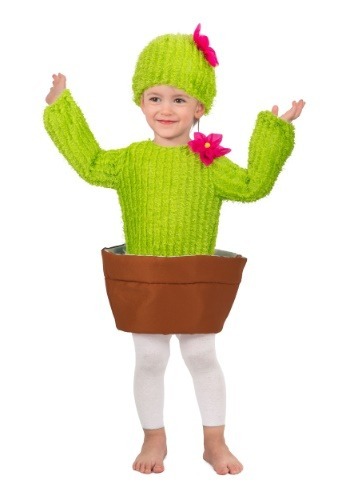 You can even trick-or-treat with your prickly kid while dressed as a potted plant. There's nothing like a little greenery to brighten up the spooky Halloween season. So whether your child's personality is prickly or sweet, dressing up as a cactus will be fun for the whole family. What better way to stick together?